Can Gemini men and women have a successful relationship that is compatible mentally, emotionally and sexually? A Gemini Man’s intelligence will be the first thing that fascinates the Aries Woman. But will it be enough to keep the fire of an Arian burning? Thankfully the Gemini zodiac sign’s air can keep the fires alive within the Gemini Man and Aries Woman relationship as you both discover and rebuild the world together. There are many aspects of a Aries Woman that will attract the Gemini Man. She is enthusiastic and energetic, and will dedicate all her attention in whatever she is doing. She will be interested in his intellectual side and will be willing to listen to him speak, as he will a lot. These two sun signs will hit things off right away and will be able to keep up with each other’s energies as hey share an excellent love compatibility. The Aries female likes to be in control and will often dominate a Gemini Aries relationship. Good thing a Gemini male doesn’t care about being the boss and will be able to work well with her. Both of this signs are prone to boredom. Good thing the Gemini and Aries can work together to overcome a stagnant time because a Gemini Man will be curious while an Aries Woman is a visionary. He might seem lost in thought, but that will not bore her, because she too is curious and wants to discover new things. To both of these star signs, love is a spontaneous happening. Neither Gemini men or Aries women are looking for the deep emotional connection of love, but simply want to feel the passion and fire that is an associated with it. An Aries Woman’s passion burns bright and she will want to control the movements in the bedroom. Thankfully, a Gemini Man can keep up with her sexual energy and be able to feed her thirst for discovery by being creative. The fire of an Aries Woman can always be a potential to burn down a Gemini Aries relationship. She can be very stubborn for a fire is in one set place while the air is carried forward by the wind. Thankfully a Gemini Man is often thoughtful and forgiving and will be able to tame the fires of an Aries Woman by slowly calming her down. Another obstacle that might bring trouble to a Gemini man Aries woman relationship is an Aries Woman ability to be very straightforward. There is no ‘beating around the bush’ with an Aries Woman. She will tell you what is on her mind and doesn’t wait to think if her words will cause any harm. Thankfully, a Gemini Man is capable of dealing with the words of any sign. He will be able to respond quickly and intelligently in order to calm any fears or worries that an Aries Woman might be having. The flow of each of these astrology signs can sometimes fall out of rhythm. The Gemini Male’s craving for knowledge will influence him to stop and think deeply while a Aries female is quick to react and will complete a project very quickly. A Gemini guy will take the time to examine something as they are walking through the park, such as a flower or an artistic statue, while the Aries lady just wants to finish the romantic walk in order to get home to the bedroom. Gemini is an air sign that is mutable and is a sign that is fixed by nature. 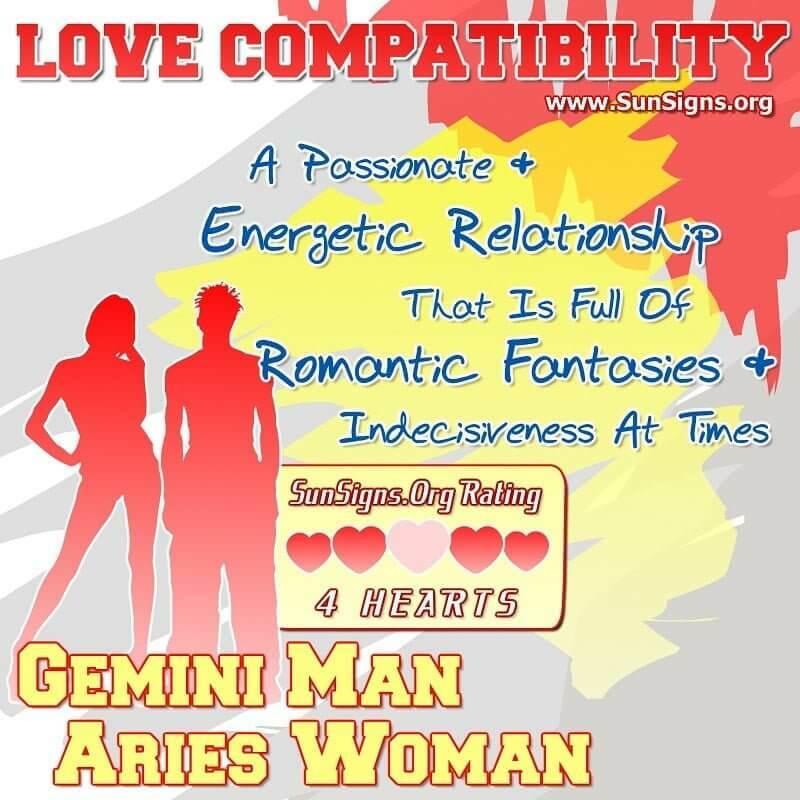 The Gemini man woman compatibility gets a FOUR Hearts love rating. The relationship between a Gemini Man and Aries Woman will be full of energy and constant passion. These two sun signs are able to keep up with each other both in communication and between the sheets. All the cons in this relationship are counter acted by the characteristics of the Gemini Man. A relationship with this much passion will never seem boring.